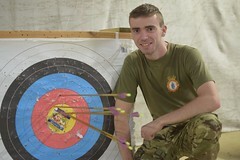 Marksmanship goes a long way back in the history of Air Cadets and is one of our most popular activities at Wantage. Think you can concentrate on distant targets and fire with consistent accuracy? It’s not easy. It requires focus, agility and a very steady hand. We’ll teach you to handle a variety of weapons safely. Firing is always done lying on your stomach (the prone position) at static targets. You’ll experience different types of weapons from .22 rifles to 5.56 and 7.62 calibre rifles and you can even take part in shooting competitions if you really prove your skills. All Air Cadets have the opportunity to take part in competitive target shooting and there are a number of local, national and international target shooting competitions held each year. If you’re good, and we mean really good, then you could qualify to shoot with the best in the country at the Bisley and Pirbright competitions. 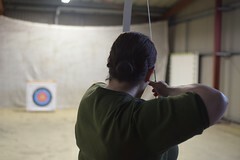 There are several events for individuals and teams. The annual highlight is the Inter-Service Cadet Rifle Meeting (ISCRM), a target shooting competition where you get to compete against members of the ACF (Army Cadet Force) and SCC (Sea Cadet Corps). 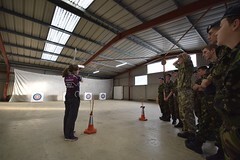 The Cadet Inter-Service Skill At Arms Meeting (CISSAM) takes place annually on the ranges at Purbright. Like the rifle meeting at Bisley, it’s a top level competition for teams and individuals. There are further competitive events available to you, including even a postal competition arranged by the RAF (Reserve Forces) Small Arms Association (RAF(RF)SAA). Ranges come in different shapes and sizes but all are in controlled conditions with full training on any weapon that you handle – safety is our top priority. To start with you’ll be firing at targets that are fairly close – around 25 metres away. As you advance through weapons and your skill builds, you will fire at targets 100 metres and more.